Guess what, everyone? 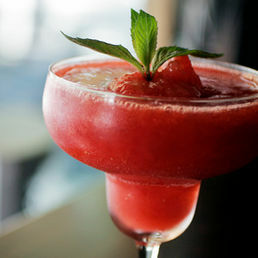 July 19th is National Daiquiri Day! So, naturally, today we’re going to talk about the daiquiri. First off, let’s clear something up right away: when I’m talking about daiquiris here, I’m not talking about those frozen, brightly-colored concoctions that spew from those giant industrial slurpee machines behind the bar. Those kind of daiquiris didn’t appear until 1937, when the Waring Blendor premiered at the National Restaurant Show in Chicago. Named after the popular bandleader Fred Waring (who helped support the original invention and fine-tuned the prototype), the new blender was eagerly accepted by overworked bartenders as a major time-saver, allowing them to churn out iced drinks at a prodigious rate. Thanks to bars picking up this new machine, daiquiris were “improved” to the point where they could be eaten like sherbet with a spoon. Some bartenders even started adding egg whites in the 1960s, making them even thicker. This freezing technique also conveniently destroyed any detectable trace of the rum itself, instead allowing the cold and the fruit flavors to dominate the palette. After a while, you sort of wonder why you have any rum in it at all, much less good rum—and thus the virgin daiquiri was born ;). Constantino is credited with inventing over 200 new drinks, but his most famous ones are the four daiquiri types he invented at his famous bar, El Floridita. I’ll be including those in a post later this week about Hemingway and the daiquiri. For now, let’s take a look at some standard vintage daiquiri recipes. While all daiquiris contain rum, lime, and sugar, as you will see that unlike that frozen stuff, ice is NOT a part of the drink itself. A *real* classic daiquiri. That’s NOT ice in the glass–it’s merely frosted, as it’s been chilled. Photo Source: here. While the daiquiri itself is much older than Prohibition, the drink became popular with American tourists during the Roaring Twenties. Like Paris before it, Cuba was an exciting new destination for Americans looking to drink well while on vacation. Thousands of bars and hotels sprung up overnight to accommodate the new influx of tourism, and any bartender could whip up some variation on the local combination of lime, sugar, and rum. Americans found such concoctions surprisingly light and refreshing, especially since white Cuban rum was quite a different creature from the traditional dark New England rum back home. The following vintage recipes feature some slight variations on the lime, sugar, and rum theme. If they also look a bit familiar, that’s probably because of my earlier post on the Bacardi Cocktail, a lemon-scented cousin of the traditional daiquiri. One portion grenadine syrup, three portions Bacardi rum, juice of one lime. Shake well, and strain into cocktail glass. Robert of the Embassy Club, who wrote up this version of the daiquiri, claims that the drink is “well known in Cuba and the Southern States of the U.S.A.,” which was likely thanks to the U.S. Naval officer discussed below. 1/6 gill of fresh Lime Juice. Of course, the idea of combining rum, sugar, and lime can hardly be called new. According to Richard Foss’s Rum: A Global History, “the trinity of rum, citrus and sugar makes it appearance very early” in world history, with all the ingredients for a Mojito (sugar, rum, lemons and limes) being a part of Columbus’ inventory when he sailed to the Caribbean for the second time back in the late 1400s. Rum, sugar, and lime were also commonly found on English ships, especially after Admiral Edward Vernon decreed in 1740 that sailors be issued limes and sugar to add to their grog rations to help stave off scurvy. Rum punch, another early combination of rum, sugar, citrus and spices, was also popular in England from 1649 through the 1890s, with its popularity hitting a high note in the 1720s. The drinks were refreshing and good at concealing sub-par rum, making them popular for much the same reason that Americans drank highly flavored cocktails during Prohibition. The other story involves a corpulent military officer named William Shafter who supposedly liked his booze and food better than he liked fighting. 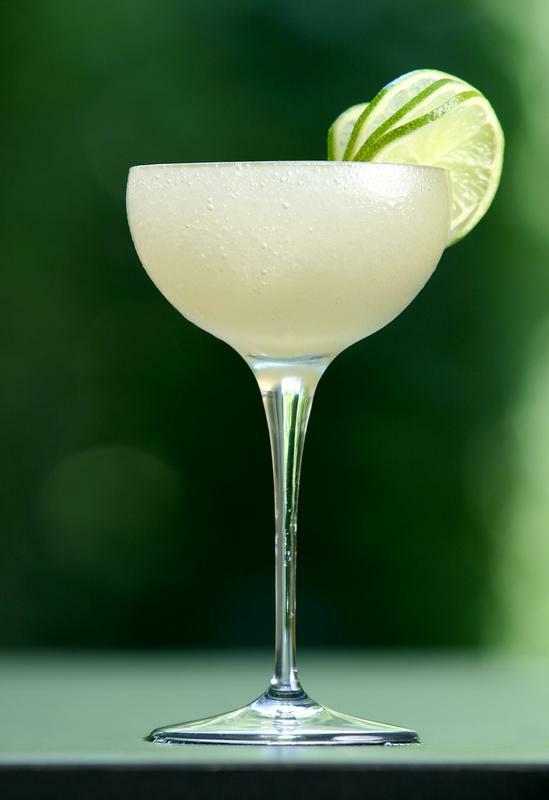 He supposedly tried the local drink of the “Cuban patriot” in 1898, a muddle of rum, lime, and sugar, and declared that “only one ingredient is missing–ice,” and thus the daiquiri was born! As for Americans becoming aware of the drink outside of Cuba, we can first thank Admiral Lucius W. Johnson for that, a US Navy officer who fell in love with the drink the first time he visited the island nation. It was he who took the drink with him back to Washington DC and introduced it to his Navy pals in 1909. After that, the drink passed into the hands of American bartenders, who tinkered with it until we get the versions we enjoy today—both the clear, cool, refined variety and the brightly colored slushy. Foss, Richard. 2012. Rum: A Global History. Reaktion Books, Ltd: London, UK. 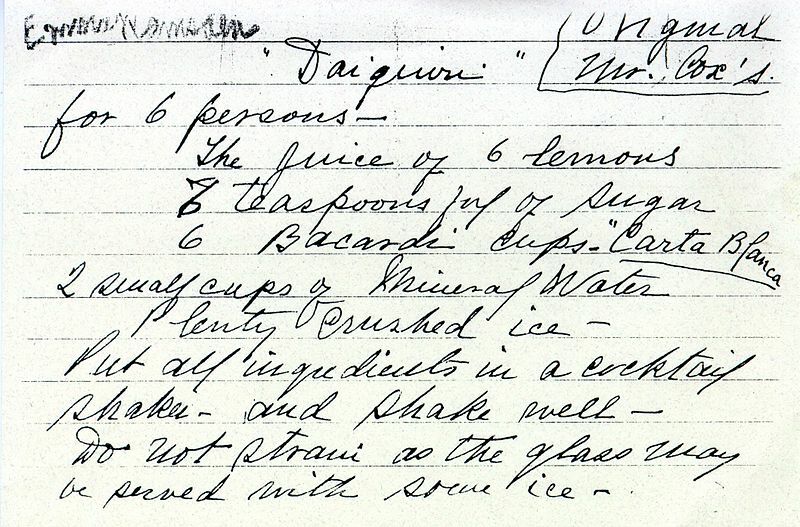 This entry was posted in drink recipes and tagged 1920s cocktail recipes, 1920s daiquiri recipes, national daiquiri day 2015, origin of daiquiri, vintage cocktail recipes. Bookmark the permalink. I would have never imagine there was a National Daiquiri Day! And hey, the Daiquiri is one of my characters’ favourite cocktail. Oh is it really? Thats awesome! Which character? Susie, she’s the one who favours Daiquiri. Sinéad like Rob Roy. Lol they’re Drys, huh? 😉 maybe they’re just too smart to get hooked on their own products ;). Susie’s the younger girl right? The one who got some poisoned booze?